Tomatoes cannot withstand frost. Choose from different types of frost protection to safeguard young plants in the spring and mature plants in the fall. By planning ahead, you can be ready when the forecast doesn’t look good for tomatoes. Tomatoes planted in garden rows can be protected from cold temperatures and frost with row covers. Two kinds are most common: floating row covers and tunnel row covers. Floating row covers are sheets of lightweight fabrics that are draped directly over tomato plants. Because you adjust the height when you set them out, they are suitable for both spring tomato seedlings (which are short) as well as mature tomato plants (which can be quite tall). Framed row covers (tunnels) cover an entire row of tomato plants or seedlings. Most tunnel row covers are not tall enough to accommodate mature fall tomatoes. They are best used in the spring to protect tomato plants from late frost. Tunnels protect plants from wind as well as frost and cold temperatures. You can purchase pre-made tunnels or make your own. Water is a good insulator. It is able to absorb and sustain heat gathered from sunlight. In addition, when water freezes, it releases a small amount of heat. Two products are favored by tomato growers to protect tomato plants by regulating the temperature around a tomato plant with water. ﻿Wall-O-Water﻿ is a self-standing set of clear tubes that surround a tomato plant. Tubes are filled with water, which warms during the day in the sunlight. Heat radiates at night to keep plants warm. has been effective in temperatures that dip down as low as 16ºF. Red Tomato Teepees operate on the same principle as Wall-O-Water, the but their tubes are colored red, allowing water to heat more quickly. Both are reusable in spring and fall and from year to year. A new product called FreezePruf, when applied 8-12 hours before a freeze or frost event, can provide 2-5 degrees of frost protection to tomatoes. There’s a good deal of science behind the biodegradable product. Bottom line, simplified: FreezePruf dehydrates plant cells to help them tolerate a frost or freeze. 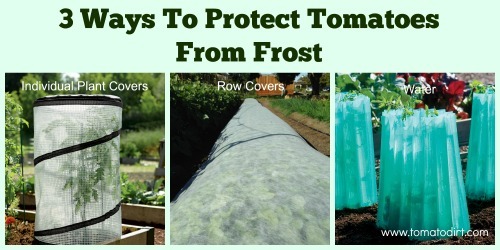 Some gardeners have success protecting tomatoes from frost the old-fashioned way – by covering plants with bed sheets, blankets, or sheets of plastic. The layer provides insulation, keeping cold out. This method takes a little bit extra work in removing the coverings during the day and making sure the plastic doesn’t touch plants. Make sure the fabric is not so heavy that it damages plants. Make sure fabric remains dry. Evaporation can lower the temperature next to the fabric. Make sure you remove fabric during the daytime so that soil can reheat and light can warm plants. 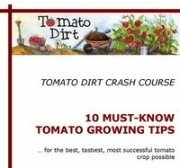 Make sure plastic does not touch tomato plants. Cold plastic will damage plants at the point of contact. Make sure you remove sheets of plastic during the daytime so that soil can reheat and light can warm plants.